Sadly we were only here for one night. As others have said this is a 5 star resort. Many places call themselves "resorts" but this truly is a very nice resort. Two sections, one for family and one for adults-what an excellent concept! The adult section has two new pickleball courts a pool & jacuzzi and its own clubhouse, all top notch! They could use a few more lounge chairs at the pool, but that's my only minor complaint about this park. The family area is very nice, level concrete pads, basketball court, single pickle ball court, and a nice pool area. In the adult area the RV pads are very big. We were in the family section and the sites are a bit smaller, but still nice with a small amount of green grass. We will certainly return to this great park, which provides excellent customer service as well. We camped at Mountain Valley RV Resort in a Motorhome. Fuel in this area tends to be pricier then the rest of the state. Two lakes within a short distance. This park is about 60 miles from Yellowstone. This campground is no frills. Water & Electric only. The dump station is monitored and controlled by the owner. I've never seen this in my 25 years of RV'ing. I dumped upon arrival and he stood next to me watching closely. We left early a few days later and couldn't dump until 8:30am. So if you want to leave the park earlier than 8:30 am you can forget about dumping your tanks, which is absolutely ridiculous for $50+ per night. If you're only there for one night dumping your tanks may not be an issue. 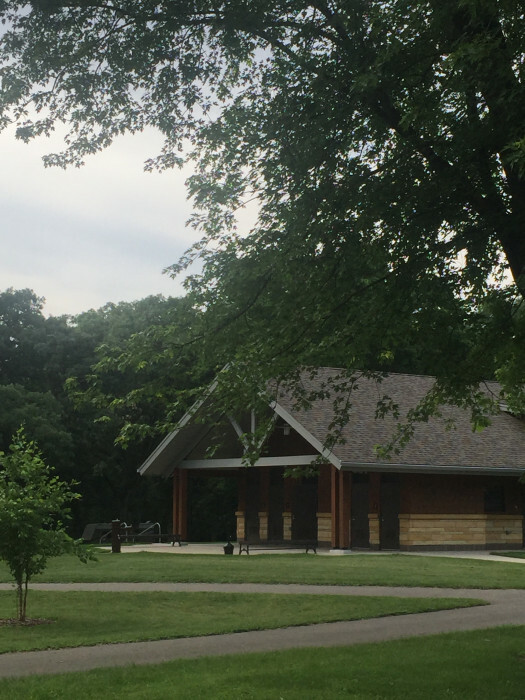 The park overall is well maintained. It is very clean. You park on gravel and cannot put out a rug. The dog park is very big & nice. We used the laundry. Two loads was $8, which I feel is overpriced. Each restroom has a shower in it. They were also clean. I would stay here again if it was only for one night. We booked last minute so the options were limited. This park is full every night in the summer. We camped at Osens RV Park & Campground in a Motorhome. Friendly people in office. We called this park last minute and got a back-in site. It's basically a parking lot with some grass behind your site. This is a good park if you're going to be busy throughout the day. There's no pool or anything else to do in the park. There are approx 10 very old and run down mobile homes in the park. Not sure why they are still here. $50 a night for a parking lot is overpriced in my opinion. The grass behind your rig is used by pet owners. The trains at night are VERY loud too. It's better than the local Walmart! 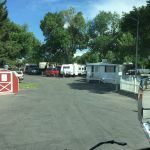 We camped at Billings Village RV Park in a Motorhome. If the KOA and Yellowstone park in the area are full this is a decent alternative. The staff here is excellent and very responsive. This was a one night stay. Sites vary - some with full hook up (some are 30amp and some are 50amp), some with electric/water, some with electric only and some with no hook ups at all. We parked at the entrance to the park, but drove through the park and thought it was nice. The old beat-up truck 'For Sale' at the entrance doesn't do this park any favors. Overall, this park was average and okay for a 1-2 night stay. They do sell propane ($3 gal.) we did play tennis on a court that looked to be an ancient asphalt parking lot, but we laughed and enjoyed it. Seemed like a great park for kids. Park is on a two lane highway, but the noise didn't bother us. 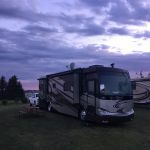 We camped at Bismarck KOA in a Motorhome. Close to the freeway and excellent for a one night stay. They give a 8 cent off coupon for fuel which saved us $7 since our fuel was on empty. If you book in advance you can get a site with trees, but it's old school, meaning a little tight and close. We called the afternoon that we needed a site and luckily we were able find one mid week for two nights. The office staff was extremely friendly and helpful at check-in. We opted to put the $10 deposit down to obtain a gate card because we were going to a Twins game and would not be back to the park prior to the 10pm gate closure time. The park is beautiful and very well maintained. In fact, I would have rated it a 10 except for the fact the tennis courts were in such poor condition. My husband and I are avid tennis players so having a playable tennis court on site would have been a huge perk. The sites are spaced nicely apart and very long. There are trees but they are trimmed to allow room for bigger rigs. We would definitely stay here again. If you pulling a tow vehicle DON'T unhook prior to arriving. It will cost you $7 more per night. 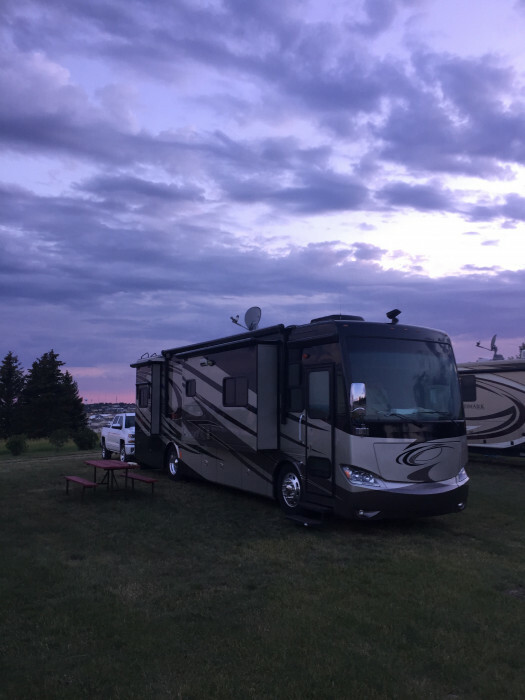 We camped at St. Croix Bluffs Regional Park in a Motorhome. After leaving a horrible campground the night before this campground was a breath of fresh air. What a wonderful job the owners do to keep this park looking nice. 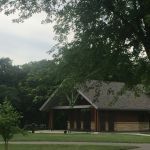 Lots of trees, clean restrooms, nice pool and great utilities. There are quite a few permanents in the park, but their sites were well maintained and set away from the part-timers. They have a very nice room with a TV, video games, pool table and a coffee machine. We will certainly return to this beautiful park. 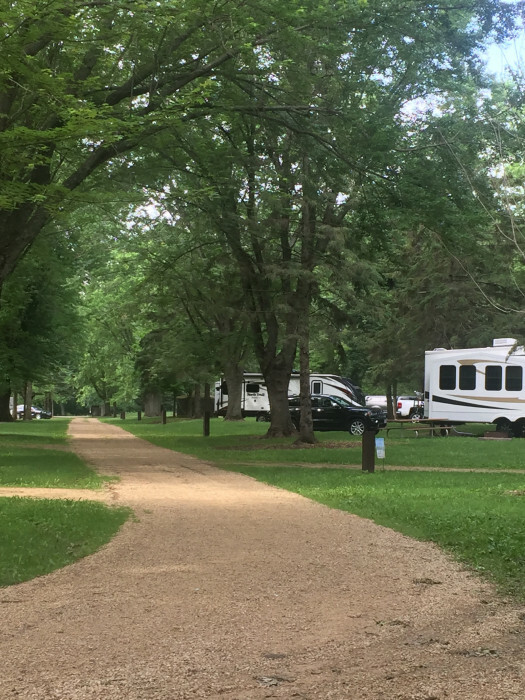 We camped at Egg Harbor Campground & RV Resort in a Motorhome. If you camp near the main road you can expect some pretty good noise. You have a choice to camp in the trees or in a newer open area, which we really enjoyed. Don't be fooled by the descriptions you read on this "campground." It is over 70% permanents. Some take care of their properties, others do not. The roads are very narrow, the RV sites are nothing special. There are three pools and one jacuzzi which was packed with little kids. 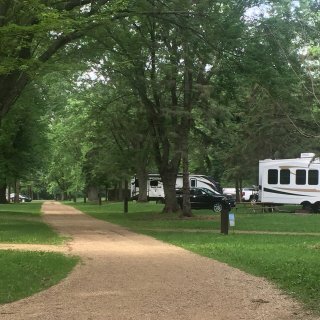 The campground is across the street from Road America, which may be great if you want to watch the races, if not, you'll hear all of the noise from the cars/motorcycles. The employees working here were VERY nice, but $80 per night for this place was a joke. We have stayed in 5 star parks that charged us only $60 per night and they were beautiful. If you have kids and need a weekend away. this place may be nice for you. If you are two retired adults I would find something else. We camped at Plymouth Rock Camping Resort in a Motorhome. 5 star park 17 miles or so from Zion NP. Friendly staff, nice pool & spa and very clean. 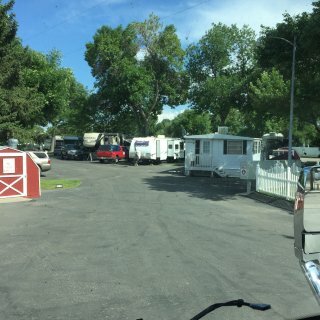 These folks know how to run an RV Park. Large trees throughout but didn't affect our ability to get satellite (site 51). The sites are a bit tight and close together but, if even a negative, didn't bother us one bit. Many concrete pads available here but back-ins are gravel. Liked the aluminum picnic tables. We will certainly return to this beautiful 5 star resort. We really appreciate that they give discounts to military & first responders. We also really enjoyed their beautiful & well stocked store/gift shop,! Oh, the email notifications while you are staying in the park are very helpful. Overall, loved it. We camped at Zion River Resort RV Park & Campground in a Motorhome. Visit the gift shop/store and try the on site grill (we didn't). This park appears to have been recently remodeled. The pool & spa are new and very nice. They do need more than 4 lounge chairs at the pool. Almost all of the RV parks in Moab sit on the main highway so expect some road noise. The majority of the park is gravel and there may be some issues with trailers/5th wheels due to a sloping camp area. This park is pet friendly & kid friendly. There are lots of trees, but we had no issue with satellite TV. During the "season" expect lots of off road vehicles in the park, something that didn't bother us. This park is very popular so I would recommend booking early. If they are full they utilize a waiting list, which greatly benefited us. Overall, good location, clean park and helpful staff. 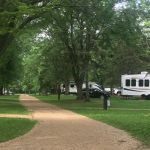 We will certainly stay here again, especially after driving through numerous other RV parks in the town. Additionally, pull thru sites will require you to disconnect tow vehicle. Lots of off-roading , hikes, beautiful scenery, can't wait to return. 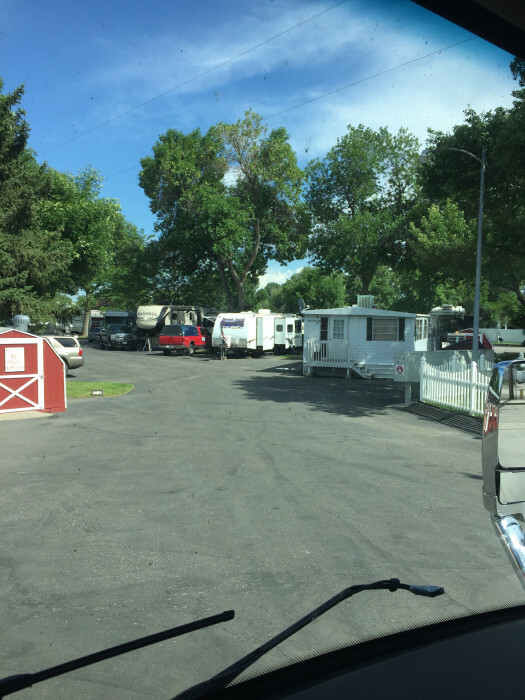 We camped at Spanish Trail RV Park & Campground in a Motorhome.